In this intensely personal journal for his daughter, Joshua Yeldham charts his life from growing up on the Hawkesbury River to becoming one of the most astonishing artists Australia has produced in decades. Yeldham’s first foray into literature, Surrender is an utterly compelling book that mirrors the complexity of his artistic practice, layering painting, photography, drawing and characteristically lithe prose. A soliloquy for his first-born, Surrender navigates Yeldham’s early life from the intense pain of schoolyard bullying as a boarder at Sydney’s elite Cranbrook school, to his time at Rhode Island School of Design, hiking in Venezuala and his odyssey into the Australian outback in a beat-up old combie. It’s a privilege to be let into Yeldham’s exquisite world as he tells his daughter about his love for her mother – his collaborator and a photographer in her own right – the pain of discovering his infertility and the ensuing IVF journey, and the joy of fatherhood. 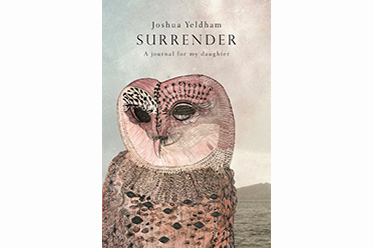 Surrender is an immensely powerful work, both in terms of its aesthetic and linguistic scope, and does not fail to impress upon the reader Yeldham’s deeply spiritual affiliation with the land and a reverential love of nature. Unique seems an inadequate word to describe the work of Award-winning artist Joshua Yeldham who, at the age of 24, won an Emmy for Best Student Film and an Academy Award for Best Dramatic Student Film (among a host of other accolades) for his film, Frailejón (1993). Working across painting, photography and sculpture, his art is held in collections around the world, and continues to astonish the art world (he has been nominated for the Wynne, the Sulman and the Archibald prizes), and now the literary world is his first book with Surrender – a stunning dedication to his daughter, the Australian landscape and the creative imagination. Surrender is published by Pan McMillan Australia under the Picador Imprint and is available from all leading book retailers. For more information, visit: www.panmacmillan.com.au for details.